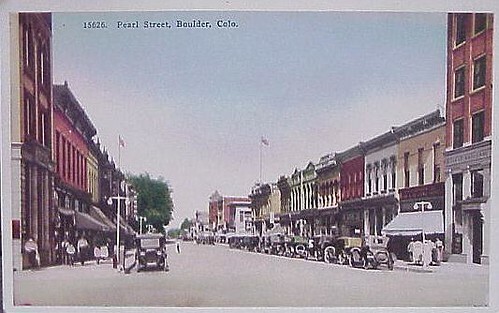 Pearl Street in Boulder, Colorado, just a few years before this story takes place. It was after morning recess in Mrs. Winter’s sixth-grade class at Mapleton School in Boulder, Colorado. I remember the moment precisely, when the boy behind me, right in the middle of the lesson, leaned over his desk and my shoulder to whisper in my ear that if I’d take a nickel down to Woolworth’s at Broadway and Pearl, I could buy this fishing “thing” with which I could catch lots of fish out at East Dagues Lake. There’s no way for me to explain why my imagination was so immediately galvanized, if not downright obsessed. I could think of nothing else the rest of the day. And that was strange because I knew nothing of fishing. My father had never fished; though assorted of my uncles sort of had, and one of those had taken me at the tender age of five, out to Johnson’s Trout Farm, where I was allowed to pull out a lot of pan-size rainbow stockers. But that was the extent of it. Granted that, as a small boy, I had doted on what was to be known as Goose Creek and is now lost under melancholy development. It was a lovely, small brook flowing east along the other side of this great old hill. There I could chase garter snakes, watch minnows and red-winged blackbirds, and generally dream away an afternoon with the sandwich my grandmother had made me.